If you want to remove your iPhone, iPad or iPod touch from your Apple ID but do not want to use iTunes, you can use the conventional methods that require your Apple ID, password, and answers to a series of security questions. More so, there is another solution – a third-party Apple ID removal tool can help you remove device from Apple ID without iTunes, password, or answers to a series of security questions. Get to know more about these solutions in the next parts of this article. Here, we will discuss the conventional method of removing device from Apple ID, and introduce the third-party tool that can achieve this without iTunes, password, or answers to a series of security questions. If you can’t remember the password to your iCloud account (Apple ID), or forgot the answers to the series of security questions you chose while setting up the account, then removing your iOS device from Apple ID will be a challenging task. However, if you use iMyFone LockWiper in removing any iOS device from your Apple ID, you don’t have to provide any password or answers to a series of security questions. Hence, LockWiper makes removing device from Apple ID without iTunes less challenging. Also, removing a device that is signed into your Apple ID is pretty straightforward, and takes only a few steps to complete. Delete iCloud account and Apple ID from any iOS device without a password, iTunes, or answers to security questions. Bypass screen passcode for disabled, locked, or broken screen iPhones, iPads and iPod touch. A complete self-service program that requires no tech skills to operate. Supports almost all the versions of iOS, and models of iOS devices. Step 1. Launch iMyFone LockWiper on your computer, and connect your activated iPhone/iPad to the computer using a USB cable. Step 2. Select "Unlock Apple ID" mode from the Home interface to remove the Apple ID and iCloud account presently associated with your iPhone, iPad or iPod touch. Step 3. Now, click the "Start to Unlock" button, LockWiper will start to unlock your device. Note: If Find My iPhone is enabled on the device, you will need to reset all settings on your iOS device: go to “Settings > General > Reset All Settings”. The following methods would require your Apple ID, password, and answers to a series of security questions before removing your device from Apple ID. However, if you remember all these requirements, then you can use them. You can iCloud Settings to see a list of device associated with your iCloud account, and remotely de-associate any device from the account. Step 1. Go to Settings on iCloud.com and look at the “Devices” section. Step 2. Click on the device you want to remove. Step 3. Click the “Delete” button next to the device. 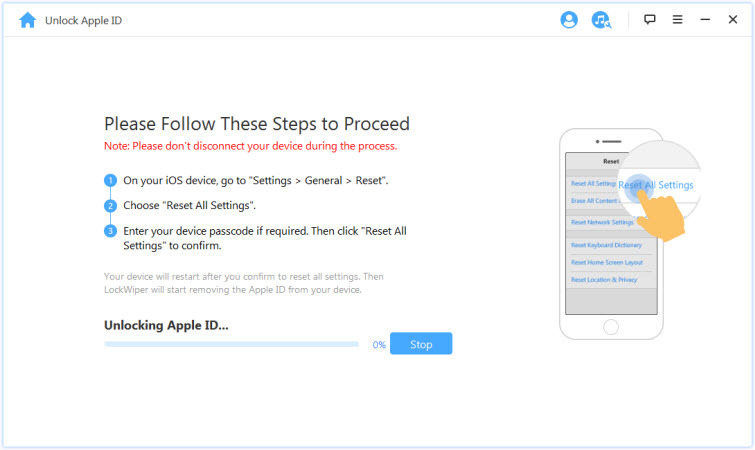 You can remove an iOS device from Apple ID using the Setting app on the iPhone, iPad or iPod touch. Step 1. Go to “Setting > Account” and scroll down to the list of devices associated with your account. Step 2. Choose the device you want to remove and click on “Remove from Account”. Step 3. Confirm by clicking the “Remove” tab. Which of These Methods is the Most Recommended? Why? iMyFone LockWiper is easy, fast, and efficient to use in removing an iCloud account (Apple ID) from a device. If you forgot your Apple ID or password, iMyFone LockWiper will help you remove Apple ID even without password or answers to security questions. LockWiper is also recommended by most tech-authorities such as cnet, PCWorld, Macworld, MacGeneration, TechRadar, iPhonelife, Cult of Mac, etc.